When it comes to luxury sedans, a lot of people shop by the badge first. For discerning buyers that can look past the German brands, Infiniti's Q50 mid-sized sedan is in the mix. And for those that favor a little more snarl under the hood, the Q50 Red Sport 400 may be a funny name but it’s no joke as it showcases what Infiniti can do when the brand wants to get technical. If you remember the top sport spec Q50 from before this refresh, then the 400 horsepower twin-turbo V6 engine is the headline you probably remember. The important thing with the Q50 Red Sport is to set the expectations. Infiniti clearly doesn't see it as a competitor for the more aggressive purebred BMW M cars or Mercedes AMG specialties. Instead, the Q50 Red Sport is set to rival Audi and Lexus offerings or something with BMW’s M Sport trim. This is neither good or bad, it simply depends on what you’re looking for and it certainly doesn’t mean the Red Sport is wafty. In fact, it's ferociously quick and endearingly agile when on pace and a comfortable city and highway cruiser when things aren’t so urgent. Photographing a car can give you a good insight into what passers-by think. A couple of people asking "Are you selling it?” means they’ve noticed it and probably think it’s cool. However, calls of, "That’s a nice car!” or people doing a double take and asking, "What exactly is that?” definitely means it’s a looker. There’s nothing particularly ostentatious about the Q50 though. It doesn’t, for example, rely on a large grill to make a statement. Instead, it’s a sum of all its parts flowing together. 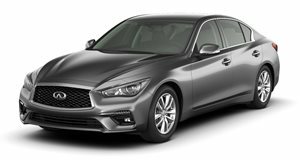 One of the most engaging aspects of the Q50's overall style is in how Infiniti has taken the idea of the front of a car being its "face” literally. Infiniti calls them its "focused human eye” headlights. Between the headlights and the refined proportions, it doesn’t immediately grab your attention. However, once it does the Q50 can really hold it. The base Q50 engine is a turbocharged 2.0-liter, 4-cylinder powerplant that makes 208 horsepower. From there, you can get a 300-hp twin-turbo V6 through the middle of the range. For the Red Sport 400, Infiniti has taken that twin-turbo V6 and cranked it up to make a more than respectable 400 hp. With that also comes 350 lb-ft of torque that’s available through much of the rev range. The engine is mated to a smooth enough 7-speed automatic transmission, and the paddle switches for the transmission have now been moved to the column rather than moving with the wheel. Although we tested the rear-wheel drive version, all-wheel-drive is available. The price for that power in the Red Sport is paid in fuel economy. The EPA rates it at 20 miles per gallon in the city and 26 mpg on the highway, and with a combined rating of 22. That price isn’t that big if you mainly drive in the city and compare it to the base 2.0-liter turbocharged four-cylinder though. The EPA estimates that to make 23 mpg in the city and 30 mpg out on the highway. With a good mixture of highway and city miles, we managed to clock in at just over 21 mpg with the Red Sport. The first thing that catches the eye inside the Q50 are the two infotainment screens. Something looks odd though, and that’s because the top screen that mainly handles navigation duties looks like a previous generation compared to the crystal clear lower screen. Beyond the waterfall center stack, just about every surface surrounding you is soft to the touch and helps make the cabin a nice place to be. The seats are what seals the deal in terms of interior comfort though, particularly with the quilted leather trim. Lumbar support is firm and adjustable, and so is the side bolstering. The extendable thigh bolstering isn’t electrically adjustable, but it’s a solid addition. The refresh across the Q50 range includes the addition of standard Forward Emergency Braking and Predictive Forward Collision Warning, and fewer option packages as many of the additional features have become standard. LUXE models now have the moonroof standard and 3.0t Sport models have a wealth of standard equipment including Infiniti's navigation service, heated front seats, 360-degree camera, Dynamic Digital Suspension, and the Bose 16-speaker sound system. Unfortunately, the infotainment technology is where we slow down the praise for the Q50. While there is embedded navigation in the top six-inch touchscreen, the graphics are years out of date and the user interface is clunky and confusing on the eye. The bottom seven-inch screen isn't particularly intuitive but there is a wealth of options in there to customize the car's settings. Unfortunately, if you want the latest and greatest infotainment then its time to look elsewhere as there isn’t even Apple Carplay or Android Auto available yet. If you’re someone that just wants the system to grab your audio via Bluetooth and play it, then the system is sufficient and the 16-speaker Bose premium audio system gets a thumbs up, although it is part of a package on the Red Sport. While Infiniti doesn’t give as freely as some of the competition in safety tech on lower trims, you can option plenty in with a package. We tried not to take advantage of the blind-spot monitoring, rear cross-traffic alert, and backup collision intervention on our tester; but we did make use of the 360-degree camera and the front and rear parking sensors. Overall, there’s plenty of room for two rear passengers even with a tall driver. A third rear passenger is a snug fit, but acceptable for occasional use. If you’re a fan of a big drink, the center drinks holders aren’t big and putting a hot and cold drink in together will end in two warm drinks. Center storage is decent and has USB ports so you can tuck your phone away, charge, and use as an MP3 player to listen to music or podcasts. Trunk capacity is just over 13 cubic feet and shaped so you can get a large suitcase down the middle and smaller bags on the outside. The rear seats also fold down 60/40 for longer items. We brought up how ferociously quick the Red Sport is earlier, and it’s not an overstatement. The power comes early with little lag and the torque is long, linear, and satisfying. There’s no histrionics from the exhaust, just a snarl mixed in with the intake noise from the turbos up front. When overtaking someone dawdling along well under the limit, it doesn’t feel like you’re being obnoxious as you would with an exhaust much louder. Instead, you’re just on your way again to where you need to be, and quite possibly grinning. Push into Sport and Sport+ mode, the suspension firms up and the transmission becomes more aggressive and holds the gears longer. It would be easy to claim the engine is the Q50 Red Sport’s one big trick, but that’s not actually the case. We spoke about expectations, and the Red Sport is not the curved blade of a BMW M3 on your favorite piece of road and track. That doesn’t mean the Red Sport not well composed and entertaining to push around. The double wishbone suspension on all four corners keep things well planted and the upgrade in brakes is a solid antidote for the extra power. Go back into comfort mode and pick up a passenger and the Red Sport falls back into the state of a big relaxed muscle. The suspension is well tuned for comfort and road noise is minimal. It’s pleasant and plush around town then shines on the highway, particularly with the predictable power always on tap. Instead of Infiniti’s fly-by-wire Direct Adaptive Steering, which hasn’t gone down well before in reviews, our tester came marked as having vehicle speed sensitive power steering. While having very light steering while parking or at lower speeds is useful, Infiniti’s settings leave a little bit to be desired in faster-moving traffic. We suspect most people will utilize the custom settings option so the steering is set to sport mode, which feels the most natural and helps make driving at highway speeds a lot smoother. The base starting price for the Q50 is $35,550 and comes with the 2.0-liter turbo 4-cylinder engine, then you can add Infiniti’s all-wheel-drive system for another $2,000. If you want the 300-hp twin-turbo 3.0-liter V6 engine, that starts at $40,300. Take that in the Sport trim, and you’re looking at $47,950, plus another $2,000 for the AWD system. The Q50 line has been streamlined, so the 3.5-liter V6 hybrid powertrain option is gone. The Q50 Red Sport 400 that we drove starts at $51,250 and can also be optioned with AWD. Our tester was the rear wheel drive version and came loaded with the Sensory Package that adds the Bose speaker system, power adjustable steering column, memory system for two drivers, and extra ambient lighting. It also had the cargo package that included carpeting in the trunk, a cargo net, and hooks for shopping bags. On top of that, the Dynamic Sunston paint is an option, as well as illuminated kick plates and welcome lighting. Finally, the carbon-fiber package adds $1,520 to the price, for a final sticker price of $58,435 including destination charges. Carbuzz spec would look a little different. The extra lighting is very nice and the trunk carpet is plush for someone wanting to splash out, but we would definitely drop the carbon-fiber option as it doesn’t necessarily suit the car and we like it as a sleeper. The Q50 needs to move people from heavy-hitters like the BMW 3 Series and the Lexus IS to be successful. While the drivetrain shows off Infiniti’s technological wizardry, it is held back from being an exceptional all-rounder by the infotainment and navigation system. As a daily driver for someone who doesn’t need that to be great, everything adds up to a car you would enjoy driving to and from work every day then taking off in for the weekend. From a pure driving enthusiast point of view, the Q50 Red Sport’s drivetrain and chassis are excellent if you come in with the right expectation. If you want the scalpel edge and the pure hoonery of a BMW M3, then go buy an M3. However, if you don’t plan on taking your car to the track, we have to say the Infiniti Q50 Red Sport is a big grin and is worth a test drive at the very least.